Summary: Most 'new' HV121P01-100 SXGA+ screens for sale on ebay, AliExpress, etc, are neither genuine nor new. 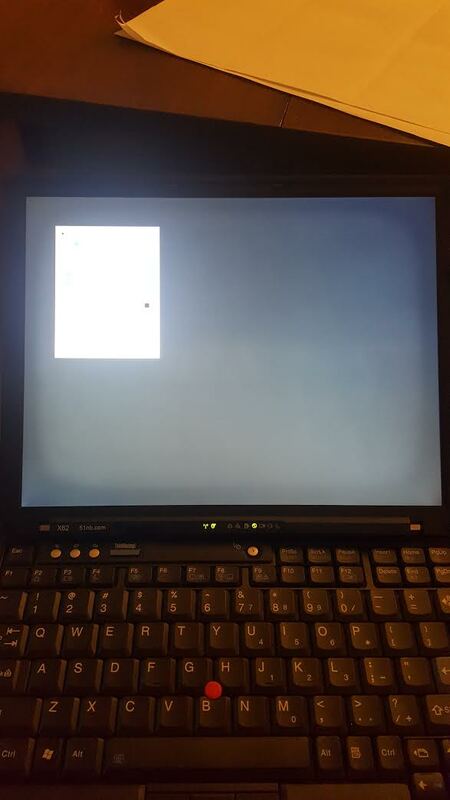 The HV121P01-100 is the screen every X60/61/62 ThinkPad modder wants. It's a reasonably high-resolution AFFS (IPS-like) screen originally offered as an option on the X60 tablet, and with a Daylight LED kit, it has excellent brightness and good (though not excellent) color accuracy. They're commonly available on eBay, Alibaba, DHgate, etc. 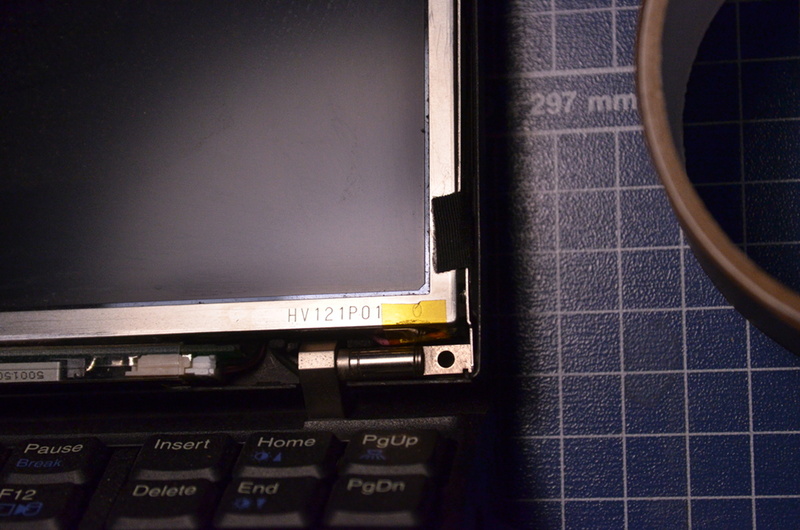 A slightly later version of the screen, the HV121P01-101, was an option on the X61 tablet, but it had a fatal flaw. Unlike the earlier version, the -101 was bonded to a glass front-surface using a 'permanent' optical adhesive. This adhesive was not in fact very permanent. It flowed when it got warm, leaving bubbles behind the glass, and a sticky, impenetrable goo all over everything. Ever get pine sap all over your hands and try to clean it off? Same thing. No really; the optical adhesive is a purified pine tar. Mmm, I do love that Christmas tree smell. 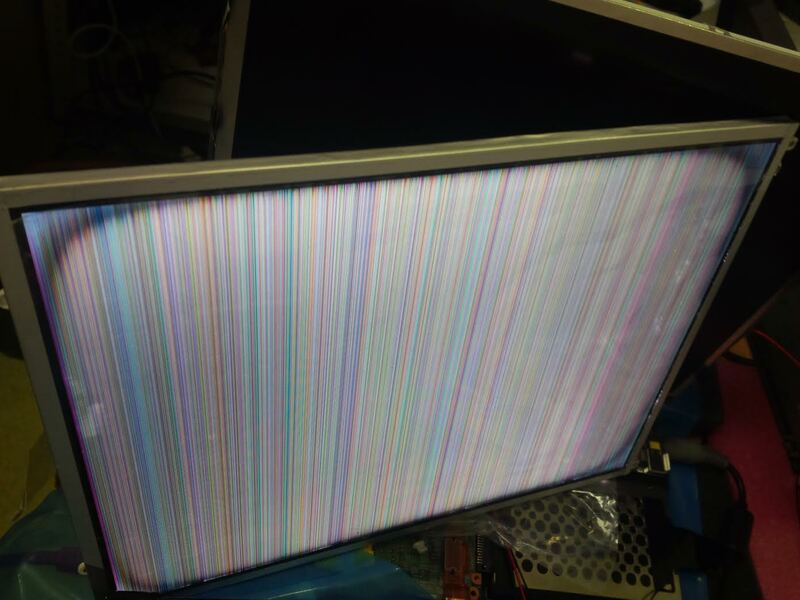 In any case, the HV121P01-101 turned out to be a warranty disaster and there were tons of these screens left over that no one could use. A few modders got reasonably good at removing the front glass and adhesive through sheer force of will and infinite effort. This task is seriously involved. I tried it. I wasn't patient enough to get better than about a 50% success rate and it sure wasn't worth the time--- especially when you could just buy a -100 version of the screen without the problem. These days, there are no more cheap -100 screens. Enter Chinese entrepreneurs and a large quantity of similar, unsold -101 screens. Rather than spending hours of careful mechanical work removing the glass fronts and adhesive from the -101 screens, you can just dump the screens into a big vat of hot solvent. Of the solvents I've tried, xylene is cheap and works well. The solvent dissolves all the adhesive away over a few days, and the glass falls right off. No fuss! This would be a brilliant solution except for one problem: it messes up the front polarizer film that's also bonded to the glass LCD matrix. Good polarizers cost more to produce than the glass LCD matrix itself. BOE/Hydis used very nice polarizers on these screens. Removing the adhesive with heat/solvents damages this expensive polarizer. Depending on the exact process, the damage can be subtle or obvious. If the damage isn't 'too bad', the screen is just sold as is, and these screens are definitely out there in the wild (see above). I know a few people who didn't notice (or weren't bothered by it) until installing a brighter backlight that made it more obvious. That's how I got the pics (thanks guys!). When the polarizer damage is too obvious, the screen rebuilder can strip off the damaged polarizer film and install a new one. Like I said, the best polarizers are really expensive, and I will say from personal experience that these rebuilders are, in general, not using the best polarizers. Cheap polarizers make for poor contrast, and cause color shifts at an angle which kind-of negates the whole point of the fancy AFFS screen. Honest resellers are up-front when the polarizer has been replaced, and the protective platic over the surface of the new polarizer will still be there when the screen arrives. Maybe you'll get lucky and it'll be a decent one. There's no way to tell ahead of time, but I personally won't bet on it. The less honest resellers won't tell you, or will claim the screen is all new. Right now, this is also easy to spot! I suppose dishonest rebuilders will eventually catch onto this trick and begin beveling their edges too, but so far they haven't. Oh, and it can get worse. Solvents will also destroy most of the other components in the screen. Some rebuilders carefully separate the parts and only dunk the glass matrices, limiting the damage to the bonded polarizer. Others just dunk the whole damned screen and let everything dissolve except for the frame, electronics and matrix. These screens then have to be built up entirely from spare parts. 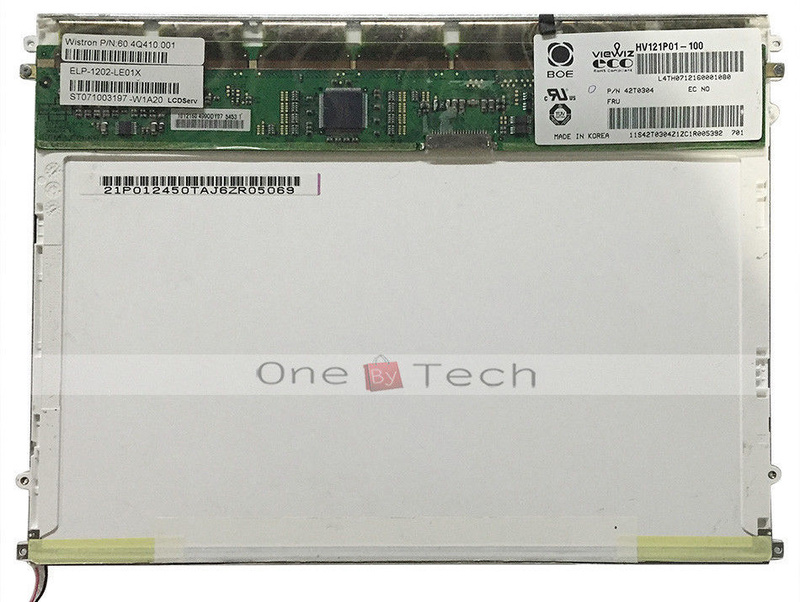 In short, many of the HV121P01-100 screens you see for sale *don't have a single HV121P01-100 part in them*. Those stickers that say 'HV121P01-100'? Fake, altered, or transferred from other screens. That closeup of 'HV121P01' stamped into the front frame? Note that it doesn't say '-100' or '-101'. Do these rebuilt screens work? Yes. The problem is that many aren't going to be anywhere close to the original performance specs. The contrast will be lower, the brightness low/uneven, the colors poor or unstable, at least relative to the original screen, which was no performance monster to begin with. Is that still worth ~ $100? You might say yes! The important thing is to know what you're getting and be able to make an informed decision. Otherwise you're playing a lottery and trusting the ticket-seller to tell you if you've won. Of course, you might get lucky and get a real -100! If you do, let me know, I've not seen one in years, and I'd really like to know where I can get some. So how do I find a real HV121P01-100? No guarantees, but look for a few things. Is the front 'glass' (acrylic on a real -100) still in place? Is the original digitizer still on the back? It's the rust-and-green flexy circuit board that provides the pen input on the tablet screen. Does the screen still have its tablet-mounting tabs? Is any of the frame tape cut, or are the internal diffuser film clips mysteriously missing (probably because the replacement diffuser films don't actually fit properly)? Is the listing using a stock pic (with a custom watermark) used by ten other resellers? Bad sign. 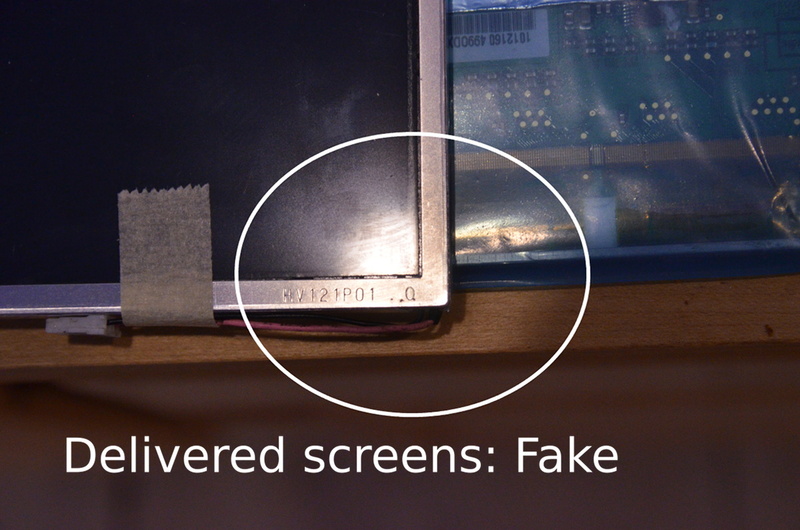 The digitizer is missing, the front acrylic is missing, the clips that hold the internal diffuser films in place are missing, the sealing tape along the bottom of the frame is cut, and the plastic cover with the 'HV121P01-100' sticker and serial number has obviously been transferred from another screen. Best of all, this is a stock pic, or rather, the exact pic is being used by 6 or 7 eBay sellers right now. They care so little about their listing, they're using a pic of a screen that's obviously been rebuilt from parts, not even trying to hide it, and the screen is listed as 'new'. WELL DONE. I TOTALLY TRUST YOU. In any case, the best way to screen out sellers is probably just to contact the seller up front and ask specific questions. Most are just resellers, and have no idea what they're selling, but you can at least ask for pics of an actual screen for sale. Any evasion from the seller is a pretty good indication you should walk away.